Markers and draw-lines are put in these category-folders in the MAP LEGEND of the Google Map. General: Info, Topics, Public lavatory etc. Most Popular Walk Routes: for Tour Guide. Stores & Tourist Spots: Location, Info. Major Walk Routes: Popular streets. Other Walk Routes: Small streets & lates. Local train & bus: Stations and route map. Hiking Trail: Including Old mountain paths. e.g.) Check the check box of Hiking Trail for hiking. - Admission fee is introduced in "Stores & Tourist Spots" regarding the public facilities such as museum. - That of temples depends on the places and each price is not mentioned in the map. Free admission for some temples and 200-500 yen for the others. - Shrines don't charge for admission, except for some special area like exhibition halls or museums in the grounds.. Note: In case of opening the map by any web application, for example Google Maps on ios (Iphone), display will be a little different. We can enjoy various routes while seeing several historical sites along the mountain paths. It's also good to take one of those trails as a way to connect tourist spots. * Be sure to get out before it gets dark. 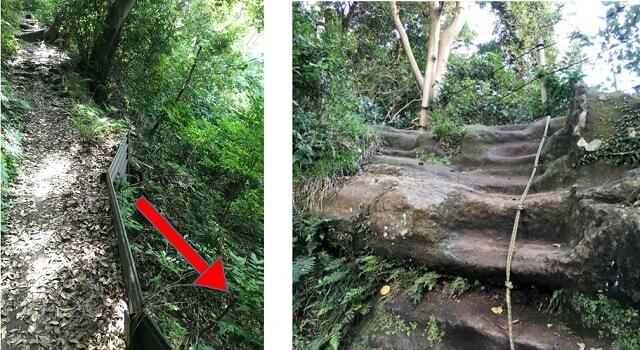 - There are some spots where a side or both sides of the walk path fall sharply. Some spots have the hand rail, but the others do not, so it's dangerous to walk in the dark. * Wear sneakers, preferably hiking-boots. - Even if the road surface is dry as the whole, the lower places which usually run along a stream are likely to be wet with mud. - If there is a rainy day in the past few days, the road surface must be muddy even on a fine day. Hiking-boots are much preferable. Sneakers are not good enough in that case. Copyright (C) 2018 Arai Kikaku, Inc. All Rights Reserved.